Apply cubicle Feng Shui tips and find yourself in your own office or business sooner than you've imagined. 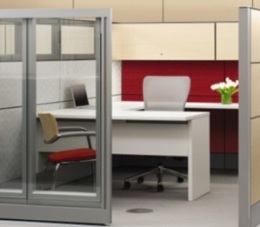 Cubicle Feng Shui tips can immediately improve your work space and empower you to take control of your career. First of all, take your "cubicle office time" as only one stepping stone in your working life. 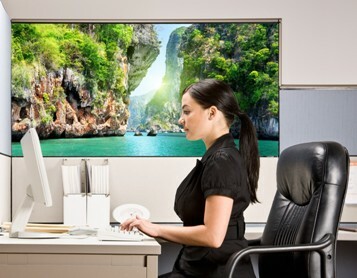 Use our Feng Shui office tips to positively energize your working space and to move ahead. 1. Create a clutter-free office environment. Your desk space should be clear of everything but the task in hand. Every day spend 9 minutes for basic clutter clearing and take care of mail, discard old catalogues, magazines and old to do notes, etc. Do not leave piled filing trays on your desk as they symbolize loads of unfinished work. Apply Feng Shui office desk tips to create the ideal power desk. Best Office Cubicle Feng Shui Tip for Power and Success at work is "Seeing The Door"
YOU need to be in control of your office space and situation. Proper office layout that allows you to know who is entering or leaving your office will make you feel comfortable and in control of any situation. Being able to see the door gives you the power. If your back or side is to the door, you are symbolically in the "victim position" allowing others to take advantage of you. Position of your desk is crucial if you want to be productive and achieve your career goals. it avoids any areas of damaging chi - hanging beams, pipes, sharp furniture corners, loud copy machine, etc. If you can't move your desk as many of cubicles are set up as countertops, place a mirror (8 x 10 or larger) in the position that will allow you to see if anybody is entering your cube. You can hang it on the wall or place it in the nice picture frame on your desk.... but definitely do it as soon as you can. basic element of success at work. Feng Shui Color Bagua for office desk can help you to organize your desk items for additional boost to your career success. 3. Get a comfortable Power Chair. Your chair should always be backed by the wall and facing the door. If you have clients or anybody else visiting your cubicle they should be seated in the smaller chair with their back to the door. If you can't have the ideal power desk location (in some cubicles there are countertops only), place a large mirror on your wall as noted above and try to get a good solid office chair at least. When you spend a considerable amount of time in one position, the furniture should be ergonomically correct - very comfortable and highly adjustable to protect your back and neck. Your office chair supports you, protects you and holds you up. Making sure you sit on a good business chair can help you achieve your work goals and dream salary. 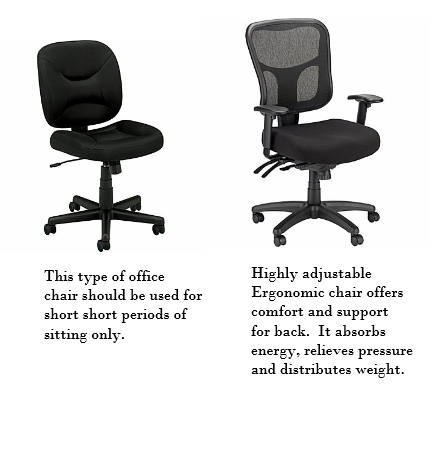 If your company doesn't offer proper office chairs, it's worth spending your own money to buy one. It will repay many times back.